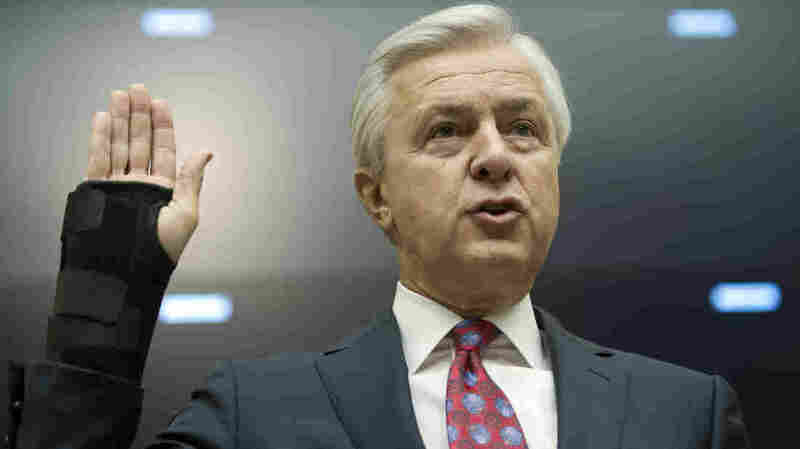 WATCH: Wells Fargo CEO John Stumpf Faces House Panel Over Fake Accounts : The Two-Way Questions for Stumpf include one about his sale of $13 million in stock, which Rep. Carolyn Maloney calls "by far the largest open-market sale of Wells Fargo stock" in the CEO's tenure. Wells Fargo CEO John Stumpf is sworn in on Capitol Hill, where he is testifying before the House Financial Services Committee about Wells Fargo's opening of unauthorized customer accounts. Days after he agreed to forfeit outstanding stock awards worth about $41 million over his bank's creation of millions of unauthorized customer accounts, Wells Fargo CEO John Stumpf is facing more questions on Capitol Hill. "We should have done more sooner," Stumpf told members of the House Financial Services Committee, adding that he and Wells Fargo will keep working on the problem. In last week's hearing, Stumpf was criticized by Republican and Democratic members of the Senate Banking Committee, and that was the case again today. Consider two early exchanges, in which Rep. Carolyn Maloney, D-N.Y., and Rep. Patrick McHenry, R-N.C., went back to back in grilling Stumpf, with Maloney taking Stumpf to task over his personal financial gains, and McHenry asking about the bank's culture. "Mr. Stumpf, we know now that whistle-blowers first contacted the Consumer Financial Control Board about the fraud at Wells Fargo in mid-2013. And you said in your Senate hearings last week that you first found out about the fake accounts in late 2013. And the L.A. Times article about the scandal was published in Dec. 21, 2013." Holding up a printout of a form Stumpf filed, Maloney said it "shows that on Oct. 30, 2013, you sold $13 million worth of Wells Fargo stock on the open market. That is by far the largest open-market sale of Wells Fargo stock that you made in your nine years as CEO. "So my question is: Did you dump $13 million of Wells Fargo stock, which you did through your family trust, right after you found out that your bank had been fraudulently opening hundreds of thousands of scam accounts, ripping off your customers?" In response, Stumpf began, "Thank you for your question. First of all, the vast majority of our employees go to work every day" — but Maloney cut him off: "Excuse me, that was not my question." After Maloney reiterated that the timing of the sale was "very, very suspicious, and it raises serious questions," Stumpf said that he currently holds "four times as many" shares as he's required to hold. The Wells Fargo CEO eventually told Maloney, "I sold those shares, and I sold them with proper approvals, with no view about anything that was going on with sales practices, or anything else." In response, Maloney said, "Well, it seems very, very suspicious that your largest sale was right after your $1.8 trillion bank was turned into a school for scoundrels." By firing thousands of lower-level employees, Stumpf shifted blame, Maloney said. Noting that some of those former employees are now suing the company, she added, "It seems that when you found out about the fake accounts, instead of helping your customers, you first helped yourself." And here's a sample of Stumpf's exchanges with McHenry, whose home turf includes two banks that are now part of Wells Fargo — First Union and Wachovia. The bank has thousands of employees in North Carolina. "What's sad to me is the impact of this on them," McHenry said, noting that Stumpf had trumpeted the mergers as a blend of compatible corporate cultures. McHenry then recited from Wells Fargo's code of ethics, particularly the CEO's message, which includes this line: "We are all responsible for maintaining the highest possible ethical standards in how we conduct our business and serve our customers." The congressman noted that the code also lays out principles of accountability at every level of the bank. Turning from the paper to face Stumpf, McHenry concluded, "You clearly have failed." McHenry added, "You have broken, and your company has broken, longstanding law. You've broken longstanding ethical standards that you have within your company. ... You've defrauded your customers." His frustration growing evident, McHenry asked the bank executive, "How can you rebuild trust, and how can you get through this thing? What standards are you holding yourself to that sends a message to the rest of these folks in your organization?" In his reply, Stumpf said, "The culture of the company is strong, and I don't" — but this time, it was McHenry who cut him off. "It's really hard to say that when you're before Congress for the second time," McHenry said, "and behind you was all the settlements you've had ... for problematic relationships you've had with your customers, by taking their money." As he had earlier, Stumpf again cited the hundreds of thousands of Wells Fargo employees "who've made their life's work and careers out of helping customers." But, McHenry said, those same employees are why he's registering "severe disappointment" in Stumpf's leadership of the bank. "You broke the law. We make the law in Congress. This is not new stuff, that all of a sudden Congress changed some rules, and you can't have your employees create fake accounts and take fees from customers unknowingly, unwittingly. That is, there's never in human history when that has been an ethical 'OK.' "
McHenry then told Stumpf, "So for you to say that the culture is OK, this seems to me that you're just tone-deaf to this." 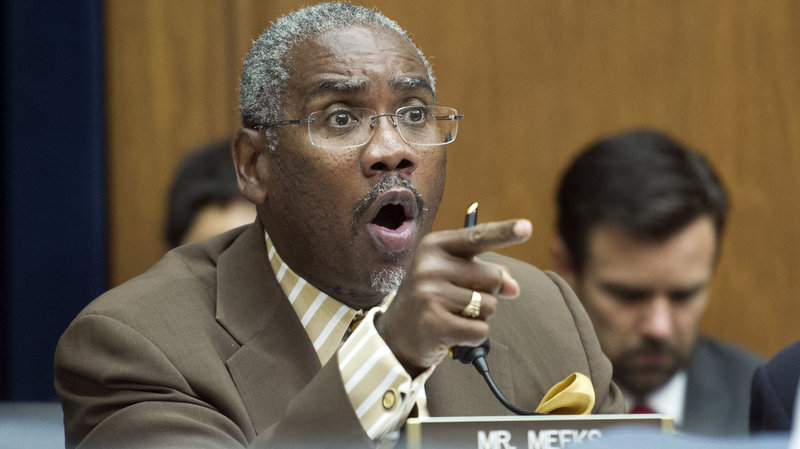 Later in the hearing, Rep. Gregory Meeks, D-N.Y., peppered Stumpf with questions about why he hadn't resigned or been fired. Rep. Gregory Meeks, D-N.Y., asked pointed questions of Wells Fargo CEO John Stumpf on Thursday, including why 5,300 employees had been fired over millions of bogus accounts but Stumpf remains in charge. "I can't believe some of what I'm hearing here," Meeks said at the start of his allotted time, midway through the hearing. He then listed a string of steep fines and penalties that Wells Fargo has paid under Stumpf's leadership — including the $1.2 billion the bank agreed to pay earlier this year for its mortgage practices. "I have a chart here that shows you've been penalized almost systematically, every year since you have been in charge," Meeks said, noting that Stumpf has been Wells' CEO since 2007 and its chairman and CEO since 2010. Answering Meeks' charge that "there's no responsibility," Stumpf replied by saying something he said several times Thursday: that he holds his job "at the pleasure of the board." "Then the whole board needs to go," Meeks said. Arguing that Stumpf operates under a double standard, Meeks noted that Wells Fargo had fired 5,300 employees when they were found to have done wrong. "Well, something is going wrong at this bank," the congressman added, shaking his printout of the bank's penalties as he spoke, "and you are the head of it." In a later exchange, Meeks said that at Wells Fargo, Stumpf has led "what basically has been a criminal enterprise." In his opening remarks, Stumpf had refused to accept the contentions made by Sen. Elizabeth Warren and others in a Senate hearing last week — that the bank's oft-stated goal of cross-selling, or encouraging customers to open additional accounts, played a crucial role in the creation of accounts that wrongly used customers' personal and financial information. "That is not the case," Stumpf told the committee. But Stumpf later noted that the bank has removed sales incentives, which have been blamed as a main reason its employees created some 2 million bogus accounts. Wells Fargo is paying $185 million in penalties for acts that date to at least 2011. The firm says it fired some 5,300 employees who were found to have created false accounts. Carrie Tolstedt, the retiring Wells Fargo executive who led the unit that was found at fault in the scandal, created a stir when it emerged that she would be leaving the bank with nearly $125 million. Earlier this week, Wells Fargo announced that Stumpf would not receive a salary while the bank investigates the case. The bank also said that Tolstedt is forfeiting outstanding stock awards worth about $19 million, and "will not be paid severance or receive any retirement enhancements." On Monday, former Wells Fargo employees filed a class-action lawsuit seeking $2.6 billion in damages, saying they and others were fired for following the law. The suit was filed on behalf of Wells Fargo employees penalized for not making sales quotas in the past 10 years.